What better way to create community awareness of serious problems going on not only in your backyard but around the world than with advertising. The underside of lids on public trash cans in Portugal read "Help. So that no one has to come here food." 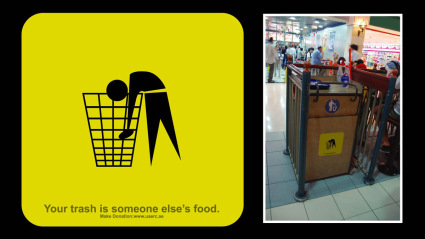 These stickers placed on trash cans read, "Your trash is someone else's food. 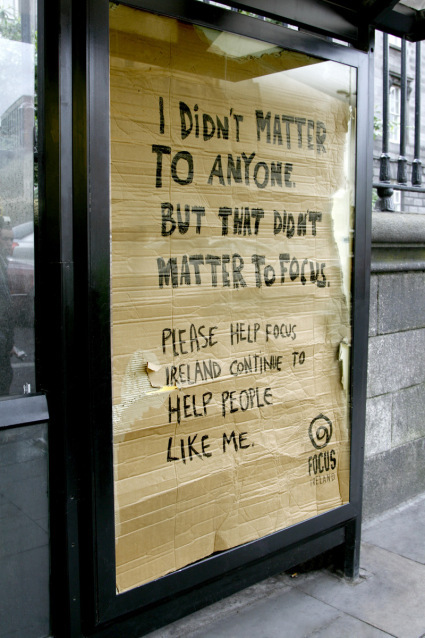 According to Ads of the World, an Irish charity that helps the homeless created these ads by taking 6 sheets of battered cardboard, handwritten and then inserted into the Adshell spaces around Dublin. 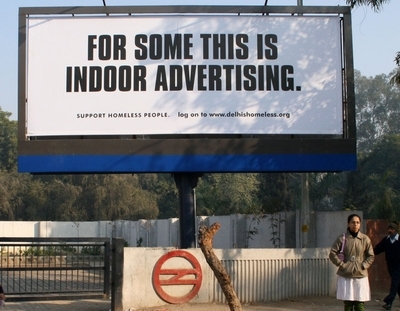 This billboard brings awareness of homelessness to those walking and driving by in India. 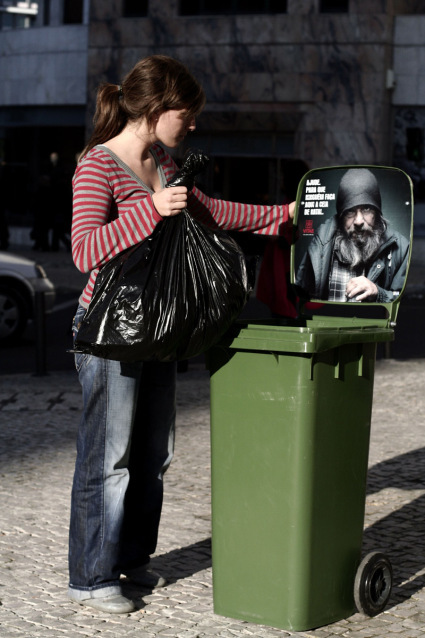 Similar to the billboards used in India above, these bench advertisements brought full awareness of a serious issue to those using the benches. 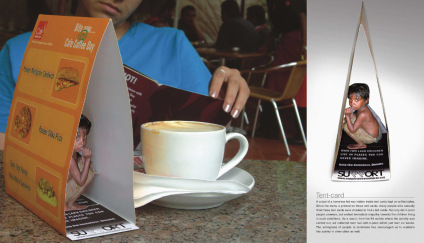 These tent cards were placed around coffee shops and restaurants in India. They showed a child hidden in the middle of the card and the copy read, "Over two lakh children live in places you can never imagine." 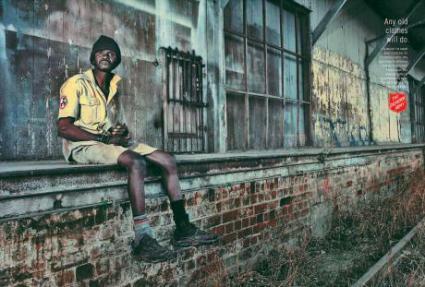 This print ad from the Salvation Army ran throughout South Africa. The copy read, "Any old clothes will do. 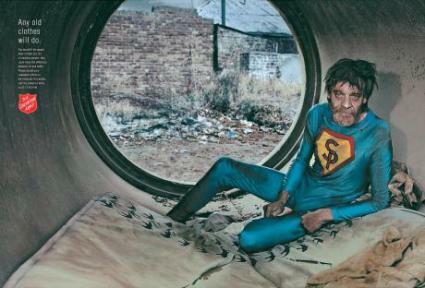 You wouldn't be caught dead in them but, for a homeless person, they could mean the difference between life and death. Please donate your unwanted clothes to the homeless this winter." 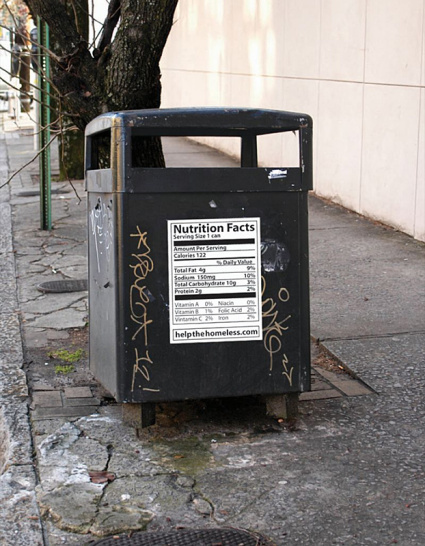 Similar to the trash can ads from Portugal and the UK, this trash can creates awareness by placing nutrition information on the outside of these trash bins. 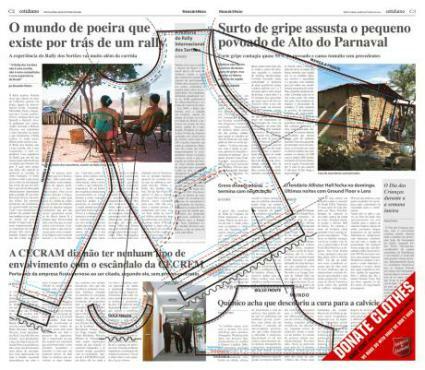 This Salvation Army ad ran in newspapers throughout Brazil. 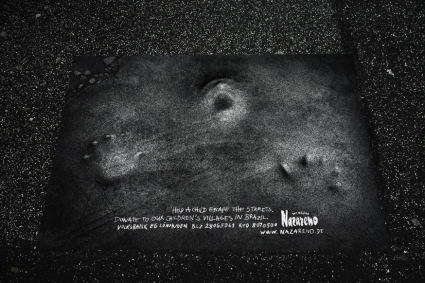 The ad consisted of the clothing outline in the middle and the following copy in the bottom right hand corner:" Donate Clothes. 5562-2285 www.exercitodasalvacao.org.br. We make do with what we don't have." What do you think of these ads? Do you think they are powerful? 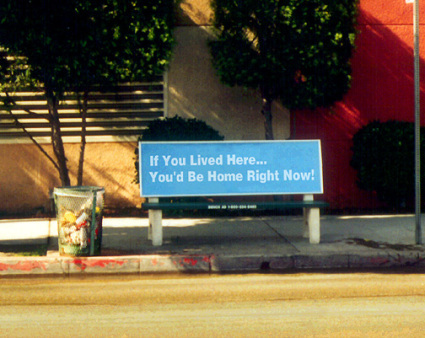 Do these ads help promote awareness of homelessness? Is that the unabomber in the first South African ad?